Hey web-heads, here's some news to get your Spider-Senses tingling: SPIDER-MAN 3 arrives on on DVD and Blu-Ray in just a few short months! The third installment of the franchise featuring everyone's favorite Wall-Crawler swings onto shelves on October 30. Just in time for Halloween, early holiday gifts, Autumnal celebrations and well, just 'cuz! Sony Pictures Entertainment is releasing the film—which already grossed a whopping $888 million worldwide in the box offices—in six different arachtastic ways that are sure to get your Spidey-juices flowing! At the top of the list is the "Spider-Man High Definition Trilogy" pack delivering all three films on Blu-ray disc—imagine all the Goblin, Doc Ock, Sandman and Venom-ous glory in HD. Go on. Imagine it. It's quite nice. The three-pack is the only shot fans will have at owning the first two Spider-Man films in the tasty hi-def Blu-Ray format, so true-believers better pounce! For those who want the trilogy but don't have the drool-worthy HD capabilities, never fear: the package will also be available on standard DVD. If you already have the first two films of the saga or only want the tertiary chapter, it will also be released in single- and double-disc editions in both Blu-Ray and standard format DVD. The solo-disc DVD is packed with super special features like a gag reel, still galleries, a Snow Patrol music video and two audio commentaries, but the double-disc DVD boasts another disc jam-packed with walloping extras such as behind-the-scenes looks at the creation of Sandman and Venom and international TV spots. 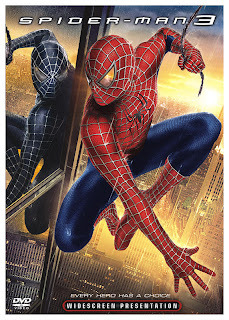 And finally, SPIDER-MAN 3 will be available for Spider-fans on the run via PSP UMD. With all those options, it's time to get your pre-orders in order!